Article framing has always been the thing to do with feature articles. Whether you have a write up in a magazine, newspaper or trade publication you can bet on the likely hood you will want to preserve the article in some fashion. Some questions might arise when you finally decide it's time to frame your magazine articles. At In The News we we specialize in mounting and laminating magazine and newspaper articles for businesses, sports figures, publishers, restaurants, hobbyists, and families from all over the United States. We offer a way for those featured in a publication to make a lasting impression by preserving and displaying their success. 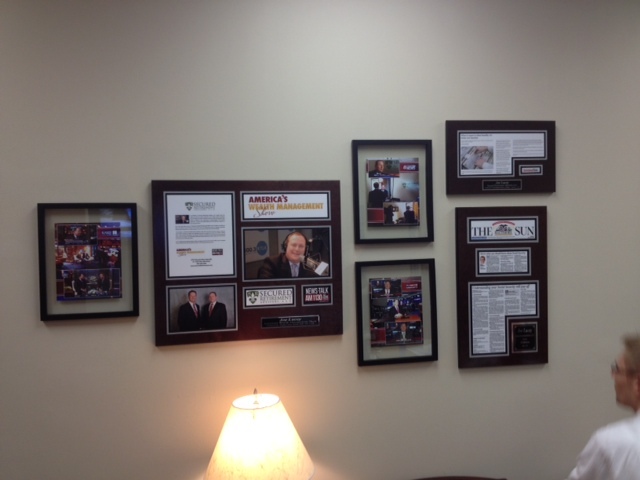 You’ve probably seen our wall displays on some of the best business walls in the country. We take your actual article matte it in black and gold trim. 99% of the time we have the article in house and do not need you to send in the material. We have a subscription library of over 6,000 publications. After we matte your article we mount it to a 3/4 inch birchwood base that's hand stained to your color choice to match your decor. Outside edges are then beveled and trimmed to give your article a picture frame effect. Helping those featured in magazine and newspaper publications is what we have done for a little over 25 years. At In The News we want to create something you will be proud to hang in your home or office for years to come.